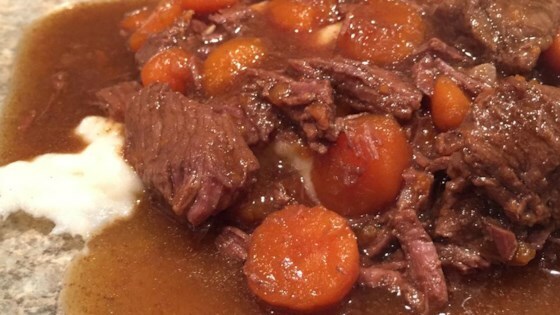 "This beef stew was made for us when we were just infants, my mother used to put it in the blender for us as babies. To this day it reminds me of home. The pressure cooker makes the meat fall apart tender and cooks up in 20 minutes." When the 20 minutes are up, release the pressure from the pot according to the manufacturer's instructions - mine needs to sit under cold running water for 5 minutes until the lid can be released. Followed the recipe as is. It was okay, but next time, I'll add more veggies to the mix and some black peppercorn. Excellent stew recipe.. I have tried a couple and this one is the best yet. I added a few chopped celery stalks, a large clove of garlic and a dash of red wine vinegar. A taste sensation!